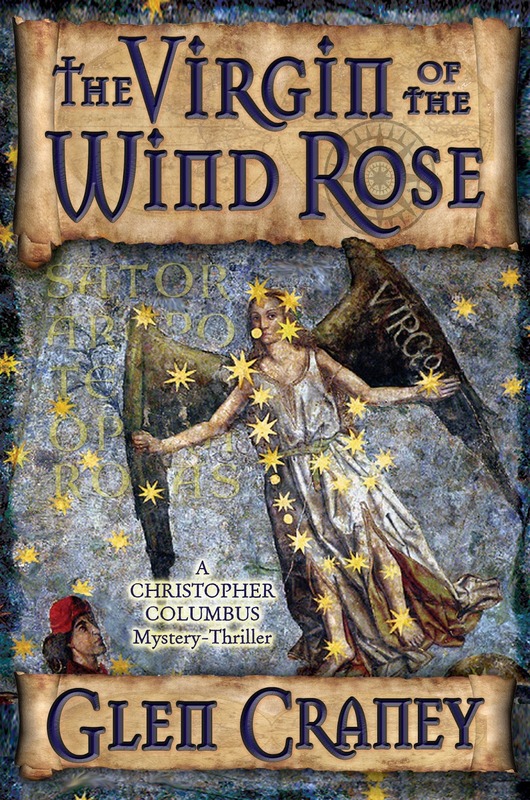 Mystery author Glen Craney joins me today and we’re talking about his new dual-period historical thriller, The Virgin of the Wind Rose: A Christopher Columbus Mystery-Thriller. Glen Craney is a novelist, screenwriter, and journalist. He holds graduate degrees from Indiana University School of Law and Columbia University School of Journalism. He practiced trial law before joining the Washington, D.C. press corps to cover national politics and the Iran-contra trial for Congressional Quarterly magazine. The Academy of Motion Pictures, Arts and Sciences awarded him the Nicholl Fellowship prize for best new screenwriting. He is a Chaucer Awards First-Place Winner, a three-time indieBRAG Medallion Honoree, and a three-time Foreword Reviews Book-of-the-Year Award Finalist. His debut historical novel, The Fire and the Light, was honored as Best New Fiction by the National Indie Excellence Awards. His books have taken readers to Occitania during the Albigensian Crusade, to the Scotland of Robert Bruce, to Portugal during the Age of Discovery, to the trenches of France during World War I, and to the American Hoovervilles of the Great Depression. Welcome, Glen. Please tell us about your current release. While investigating the murder of an American missionary in Ethiopia, rookie State Department lawyer Jaqueline Quartermane stumbles upon the infamous Templar Word Square, an ancient Latin puzzle that has eluded scholars for centuries. To her horror, she soon discovers the palindrome has been embedded with a cryptographic time bomb. Separated by half a millennium, two global conspiracies dovetail in this historical mystery-thriller to expose the world's most explosive secret: The real identity and mission of Christopher Columbus. I often get my book ideas from dreams. One night, I kept hearing the word “SATOR” spoken in my ear. I had never heard of that word, so I was obviously baffled. When I researched it, I came across an ancient Latin palindrome called the SATOR, or Templar, Square. That launched me on a detective quest that resulted in the novel. the first man on Earth. tunic’s sleeve to avoid being swarmed by the bees that hived in the crevices. the long notch in the floor where the angels had once stored their lances. “Mäqäraräb,” he whispered. Not far now. accompanied the priests on their daily inspections of the subterranean churches. would find prosperous construction work and a beautiful girlfriend. would celebrate Timkat, the holiest of their many religious festivals. the nave, and ran a finger across an inscription on a stone carved in Ge’ez. The opening verse of Genesis. he reached up and inserted the stolen key into the lock just beyond the grave. After several turns of the rusty tumbler, the pitted door squealed open. who had ruled Ethiopia during the time of the White Knights. hidden treasures of Lalibela will be struck blind and mute for eternity. I’m in the midst of a historical novel set during the last days of the American Civil War. I’ve always written for the jobs I’ve held, but I’ve taken a roundabout route to fiction. I went to law school and wrote legal opinions for appellate and federal district judges. Then, I worked as a reporter covering national politics for a magazine in Washington, D.C. After that, I wrote movie scripts for Hollywood, which led me to books and novels. I do write full-time. When not researching or traveling for my projects, I prefer to write in the mornings and edit in the afternoons. I like to write in restaurants and cafes. To the amazement of the waiters, I’m able to concentrate better with the ambient noise and movement around me. I’ve loved history and its mysteries since childhood, so I always knew I wanted to do something involving those subjects. I always chase stories instead of historical eras. I blame my journalism experience. Thanks for being here today, Glen! Thanks for hosting me, Lisa!